Who Should Buy A Weslo? Weslo treadmills' main attraction is its price. If you're the price-conscious type of person who would rather save money than buy high quality treadmills, then this brand is perfect for you. These are probably some of the most inexpensive treadmills you would find in the market today. However, I believe that these machines are not for everyone. It doesn't have the durability and strength serious runners look for in an exercise equipment. And since they are cheaper than most treadmills, expect their features, specs, and quality to be below average. Weslo treadmills are made by the largest manufacturer and marketer of exercise equipment in the world, which is Icon Health and Fitness. It has 4,800 employees and 10 manufacturing facilities in the United Stated, Canada and China. Weslo is the entry level brand of Icon. It is the cheapest treadmill brand being offered by that company. Most are priced below $1,000 which makes it probably one of the lowest priced treadmill brands in the market today. 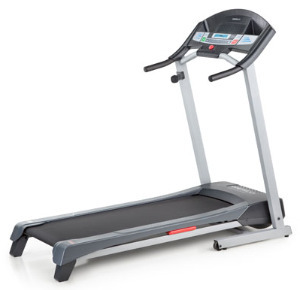 Other than Weslo's short warranties, which are to be expected with most low priced treadmills, another weakness is that these treadmills are not as comfortable to run on as some people would want them to be. Also, expect them to lack tons of features found in more expensive treadmills. But before you buy, be sure to check out our reviews of individual Weslo machines below. However, if you're looking for feature rich treadmills for the lowest possible price, then this brand is worth investigating. Others: This is currently one of the cheapest treadmills in the market today with a heart rate feature. It also has 2 manual incline positions (1.5% and 6%). Others: This is another cheap treadmill from Weslo that comes with poor quality. You should probably just skip this one. Below are some of the older treadmills from Weslo that have been discontinued. I would keep the reviews here as auction sites and other online retailers still sell most of these treadmills either as used or new. Others: This one had a manual incline with 3 positions. This system provided adjustments that lock in place for stability and consistency. Others:Uses manual incline with 4 position Incline (3%,5%,7% & 9%)--This system provided adjustments that lock in place for stability and consistency. Others: During its introduction, this was one of the few below $400 treadmills with adjustable incline. Others: One of the newer models from Weslo released last 2009. Others:This was another one of those extremely cheap Weslo treadmills with very poor quality. Others: Unlike most Weslo Treadmills, this one included 1-, 2- and 3-pound hand weights to build upper body strength during workouts. Others:Nothing new about this treadmill, just like most Weslo Treadmills, this one also came with power incline feature. Others: This was another very affordable entry level treadmill from Weslo. Others: This was one of Weslo’s higher priced entry level treadmills. Have You Tried a Weslo Treadmill? If you're using or have used a Weslo, chances are visitors of this site would love to hear from you. Write about your experience! It's fun, free and easy to do. Note: This site would no longer accept submissions that doesn't really offer any value to other readers of this site. Adding pictures improve your credibility and keep your contribution more interesting.